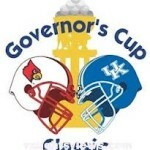 Billy Reed, the state’s preeminent, award winningest sports scribe, Facebook posted an interesting perspective on future pigskin encounters between the Cards and Cats. Which are slated, thanks to edicts by their respective conferences, to be played at the end of the season during rivalry week. I expect The World Wide Leader also had something to do with the decision. The geniuses of the SEC and ACC have mandated that UK and U of L play football the last game of the season, beginning next year. That means they’ll be going up against the great slate of rivalry games that we’re seeing today. With all due respect, UK-U of L will be lost in the shuffle most years. Not even a blip on the national screen. So I think the schools should jointly petition their conferences to make an exception and allow them to play the first game of the season, where it always has drawn the most attention both locally and nationally. It’s at least worth a shot. For Louisville fans, during the successes of The Schnell Era, the Bobby P years and in the aftermath of last year’s stunning Sugar Bowl W, a mantra evolved, “We’re a football school.” Partially in jest, I have to believe. Somewhat hopeful for others, I suspect. But a specious claim nonetheless. I trust no UK fan has ever uttered such nonsense. But the BBN is a hearty, hopeful lot. 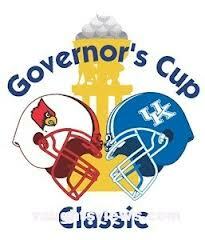 At any rate, such a scenario makes it a put up or shut up time for Cardinal and Wildcat fans. If it’s truly a rivalry game, one with little history, but plenty of enmity, what’s on TV at kickoff shouldn’t matter. How bad or good the teams are shouldn’t matter. You think the fans of, say, Georgia and Georgia Tech stayed home to watch games on the telly. How about the pigskin public of South Carolina? You figure many stayed at home yesterday to watch those schools over in Alabama instead of the Gamecocks vs. Dabo’ Orange Tigers? How about the 113,000+ in the Big House? You think many scored their seats because a neighbor stayed home to watch Sparty tangle with the Golden Gophers? I love Feathers ‘n’ Fur as the season opener. But, starting a new tradition works too. You get my point. If UK fans and U of L fans really care about football, really want to sock it to their hated rival, they’ll show up and neither rain nor sleet nor snow nor a Jay Cardosi weather event nor an Iron Bowl with Bear Bryant and Sug Jordan themselves roaming the sidelines will get in the way. Who cares if our game gets lost in the wake of UCLA vs. Southern Cal? Besides the muckety mucks at ESPN will more than likely schedule it at an off hour, like opposite Lions vs. Packers at noon on Thanksgiving Day. And if local football fans don’t show, well, they’re the turkeys. And if we’re not willing to go there, let’s just call it as it really is. We live in Hoopsylvania. Always have. Always will.